The Sri Lanka Campaign was founded nearly five years ago with four key objectives. The first was the establishment of an independent international investigation. Today that objective was achieved. To undertake a comprehensive investigation into alleged serious violations and abuses of human rights and related crimes by both parties in Sri Lanka during the period covered by the Lessons Learnt and Reconciliation Commission, and to establish the facts and circumstances of such alleged violations and of the crimes perpetrated with a view to avoiding impunity and ensuring accountability, with assistance from relevant experts and special procedures mandate holders. No resolution is going to do 100% of the things we want, but the High Commissioner for Human Rights now has a clear mandate for a robust and thorough investigation into what took place, and is taking place, in Sri Lanka. It is important that she, and her successor, use it and use it well, and that is why our work here isn’t done, and won’t be done until there is justice in Sri Lanka, and the peace that that will bring. Our work also isn’t done because we are very worried about what the next few weeks will bring, as the Sri Lankan Government no longer feels any need to hold back in its attempt to crush dissent. Campaigner for the Disappeared Balendran Jeyakumari, and at least 10 others, remain in detention without access to their lawyers, and without any evidence having been produced. Meanwhile freed activists Ruki Fernando and Fr Praveen Mahesan remain subjected to a gagging order and continued judicial harassment. Support our campaign. Unfortunately our work is not free, and we rely on the donations of people like you to keep going. Join our effort to free Balendran Jeyakumari and others held without evidence. Support the Human Rights Observatory‘s attempt to have the gag order on Ruki Fernando and Father Praveen Mahesan lifted. The next few weeks could be tough, but at least tonight we are one step closer to ending Sri Lanka’s culture of impunity, and stopping the suffering that brings. For: 23 Argentina, Austria, Benin, Botswana, Brazil, Chile, Costa Rica, Cote D’Ivoire, Czech Republic, Estonia, France, Germany, Ireland, Italy, Mexico, Montenegro, Peru, Rep. of Korea, Romania, Sierra Leone, Macedonia, UK, USA. Against: 12 Algeria, China, Congo, Cuba, Kenya, Maldives, Pakistan, Russia, Saudi Arabia, UAE, Venezuela,Vietnam. Abstain: 12 Burkina Faso, Ethiopia, Gabon, India, Indonesia, Japan, Kazakhstan, Kuwait, Morocco, Namibia, Philippines, South Africa. Against: 14 Algeria, China, Congo, Cuba, India, Indonesia, Kenya, Maldives, Pakistan, Russia, Saudi Arabia, UAE, Venezuela,Vietnam. Abstain: 10 Burkina Faso, Ethiopia, Gabon, Japan, Kazakhstan, Kuwait, Morocco, Namibia, Philippines, South Africa. Against: 25 Argentina, Austria, Benin, Botswana, Brazil, Chile, Costa Rica, Cote d’Ivoire, Czech Republic, Estonia, France, Germany, Ireland, Italy, Japan, Mexico, Montenegro, Peru, Philippines, Republic of Korea, Romania, Sierra Leone, Macedonia, UK, USA. Albania, Austria, Belgium, Bulgaria, Canada, Croatia, Cyprus, Denmark, Estonia, Finland, France, Georgia, Germany, Greece, Hungary, Iceland, Ireland, Italy, Latvia, Liechtenstein, Lithuania, Luxembourg, Mauritius, Montenegro, Netherlands, Norway, Poland, Portugal, Romania, Saint Kitts and Nevis, Sierra Leone, Slovakia, Spain, Sweden, Switzerland, the former Yugoslav Republic of Macedonia, United Kingdom of Great Britain and Northern Ireland, United States of America. 12. Calls upon the Government of Sri Lanka to cooperate with the Office of the High Commissioner in the implementation of the present resolution. 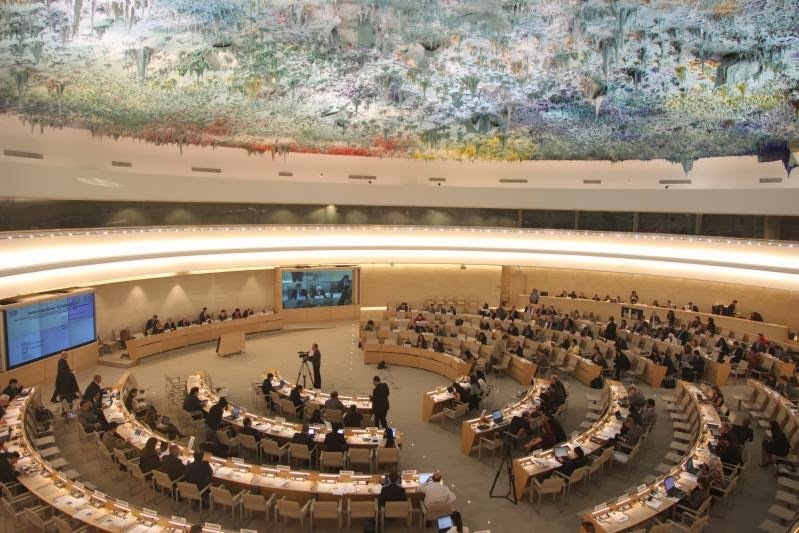 The Sri Lanka Campaign for Peace and Justice today welcomed the decision of the UN Human Rights Council to establish an independent international investigation, while warning of a backlash against activists in Sri Lanka. “It has been obvious for at least three years that only an independent international investigation can establish the truth about what happened in Sri Lanka in the last months of the civil war. There is credible evidence that both sides committed crimes against humanity, and the lack of accountability for this has engendered a culture of impunity which has led to further outrages. We believe that these too amount to crimes against humanity, and that they persist to this day. “The High Commissioner for Human Rights now has a clear mandate to conduct a robust and thorough investigation into what took place, and is taking place, in Sri Lanka. It is important that she, and her successor, make full use of this mandate.